What a fabulous week off I have just had, the weather has been fantastic and I have spent lots of time crafting. This post is to share a new technique that I learnt the Demonstration Day kindly arranged by Bee Crafty. The wonderful Michelle Johnson from Woodware & Stix2 came along to demo, armed with a huge array of crafting items, adhesive pads, adhesive sheets, a glue gun and glue sticks, glitters, foils, mica powders and lots of stunning samples. One of the aims of the demo day was to show us how to make our own toppers using a hot glue gun! 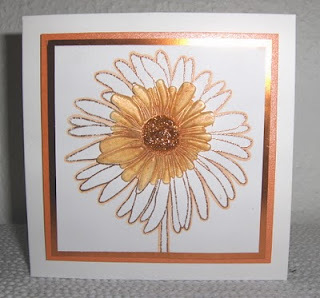 To make the centre of card shown above - First I stamped the image (Woodware's Gerbera Clear Stamp) using a Versamark watermark stamp pad, then I sprinkled copper coloured embossing powder over the image, tapped off the excess and used my heat gun to emboss the image. I went around the image with a Promarker with an extra fine nib, to give the image a little more depth. Then matted and layered it onto a couple of pieces of copper card stock (one mirror card, the other Matt). Then the fun began! Having pre-heated my newly purchased Stix2 glue gun I squeezed some glue (about the size of a two pound coin) onto a heat proof craft sheet. I covered the surface of my Gerbera clear stamp with some more Versamark and then pressed it into the glue. (Don't use a stamp block for this stage as you need to be able to feel the temperature of the stamp) Once the back of the stamp had cooled down, I gently peeled the stamp away from the glue and was amazed that I was left with a rreplica of the centre of the Gerbera image. I cut away a few straggly bits and them brushed the surface of the glue image with some mica powder to give it colour. I also added some copper glitter to the centre of the flower for added sparkle. The topper was then added to my card with some strong wet adhesive. Those who know me will know that I am not one for what I call "messy crafting" but I can honestly say I that having dabbled into the world of messy crafting I am a total convert!! Am off to get my glue gun out again - all the items used to make the above card are available to purchase from Bee Crafty - either in person or on-line! 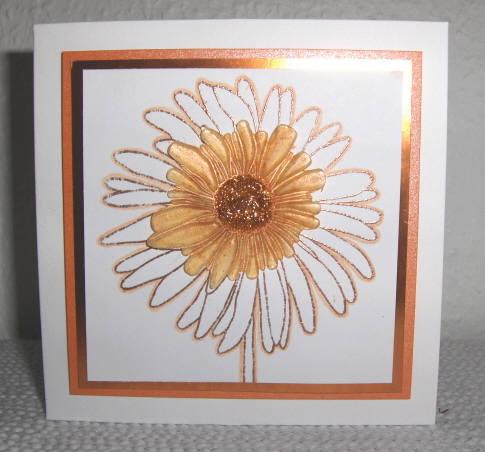 A really beautiful card, Thanks for joining in at the Crafty bloggers Network challenge.